Morning!!!!!. Well what a difference a day makes, glorious sunshine yesterday, dull and wet today. At least when the weather is like this it's ideal for crafting. Here is another sneak peak of Sheenas new stamps which will be launched on Friday on Create and Craft. I have used elements from three of the stamp set (Oak Tree, Wings and Ironworks). 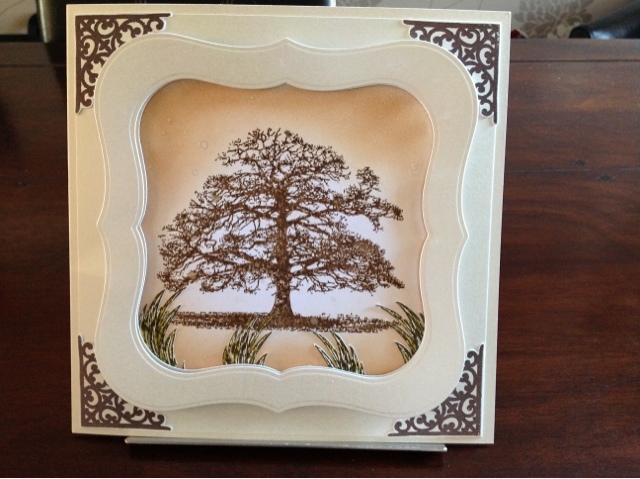 The tree is stamped using Walnut Stain Distress Ink, and the edges distressed with Vintage Photo. The grasses are stamped with Peeled Paint and then blended with water. Ok, I confess, they are not really grasses, but I've used the tips of the wings to create the grasses. I have when spritzed overhead image with water, and then with some Gold Pearl Glimmer Mist. The Ironwork corners are embossed with WOW embossing powder. Matted and layered onto Centura Pearl, and then the frame is cut from Spellbinders Grand Labels One. Gorgeous, love the tree it is fabulous. Another beauty, Caroline. Like Fiona says, those wings make brilliant grasses.